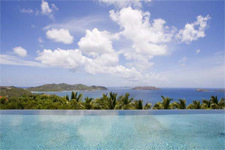 September 2007 – Wimco Villas, the leading villa specialist company, is pleased to announce that a villa holiday on the beautiful island of St Barths is now even more accessible from the UK thanks to the introduction of daily connecting flights from Antigua with Caribbean airline Win-Air. The Win-Air flights are scheduled to start on 3 December 2007 and are positioned to connect with Virgin Atlantic and British Airways flights from the UK. Prices for the Antigua - St Barths flight will start from £250 one way and Wimco Villa clients in the UK will be able to book both legs of the journey (UK – Antigua - St Barths) through Wimco Villa’s reservations department (www.wimco.com / tel: 0870 850 1144). The introduction of the Win-Air flights means UK passengers will now be able to enjoy the convenience of being able to fly to St Barths on the same day without having to spend a night in Antigua. Previously, passengers travelling to St Barths, via Antigua, would either have had to charter their own plane from Antigua at considerable cost to ensure same day arrival in St Barths or they would have had to fly on to St Martin and stay overnight, continuing on to St Barts the next morning. Currently, the only alternative option for getting to St Barths is to fly two different legs (UK-Paris-St Martin) with Air France before connecting in St Martin with Win-Air which involves a total of two changes and, depending on UK departure time, a night’s stop over in Paris. Wimco Villas represents over 260 villas on St Barths ranging from a three bedroom villa at £2,108 per week to £21,622 per week for a four bedroom villa. This autumn, Wimco Villas are pleased to introduce five new exclusive villas on the island including the breathtaking Hill House (SIB BOW) and high-design villa SIB CJB. 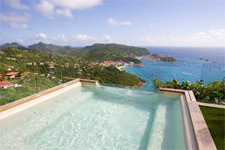 A new, high-design four bedroom villa (sleeps eight) in Colombier. 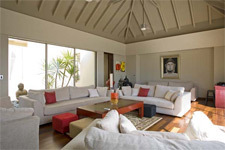 Its hilltop position makes it extremely private and gives it marvellous views over the island to Gustavia harbour. Interiors, by renowned local architect Olivier Dain, are contemporary and rich – modern art mixes with sculptures and antiques from the Orient. The infinity pool has breathtaking ocean views and stretches the length of the villa with a spacious terrace running alongside it. There is also a private screening room and for the privacy hungry. Each bedroom also has its own private terrace. Villa SIB CJB is available from £21,622 per week*. This price includes seven nights accommodation and daily maid service. Hill House (sleeps eight) has been designed so that guests are guaranteed complete privacy from one another; accommodation is set in four separate one bedroom cottages, each one with its own en-suite bathroom and private terrace. The kitchen, living areas and bar are set in centrally, looking out over an impressive infinity pool and surrounded by private gardens. By the pool is a contemporary gazebo with an outsize squashy sofa, dining area and barbecue. Hill House (SIB BOW) is available from £13,541 per week*. This price includes seven nights accommodation and daily maid service. Wimco Villas is a luxury villa company, providing access to some of the world’s most beautiful and exceptional villas in Italy, the South of France, Morocco, Mykonos, Santorini, Hydra, Rhodes and the Caribbean. Wimco’s inspection process of visiting and evaluating each villa guarantees that a match is made for each client’s expectation of value. As well as providing flight reservations, accommodation and destination information, Wimco can tailor make the villa holidays to suit each client’s needs, whether it be private chefs, yoga instructors, yacht charters or simply a reservation.